Not my dogs, but similar to them. cute huh ? I grew up with my german shepherds by my side since i was just a baby. I had two, Shadow and Jessie. Shadow was more black, and Jessie was more golden. But I loved them. As a baby I used to follow them around on all fours, sleep in their dog bed with them instead of my own crib and much more. They were super protective of me, and acted like guard dogs whenever the bell rang. Jessie would drag me off to the corner dog bed, in the lightest grip, while Shadow stood guard and barked loudly. Sometimes they didn't even let my parents come near me. And they were the most tolerant dogs you would have ever seen! when I was baby I used climb all over them, pull on their fur ect. (sorry, wasn't being mean, just being a baby) but they never once snapped at me. One time when I was playing in my sandbox in the back garden whilst my dad was fixing a window upstairs in the house, Shadow just came rushing around the corner from the front and started barking like mad at the grass, standing in front of me. My dad looked out of window, and saw a snake in the garden, coming towards the house and too me. It looked like a black Mamba. Quickly my dad rushed from the house, and shooed the snake away with a broom (we lived in South Africa at the time). of course we didn't leave them homeless. The people moving into our house were friends of the family, and they took on the dogs when we left. of course I left screaming and crying, and not a day goes by that I don't miss them. 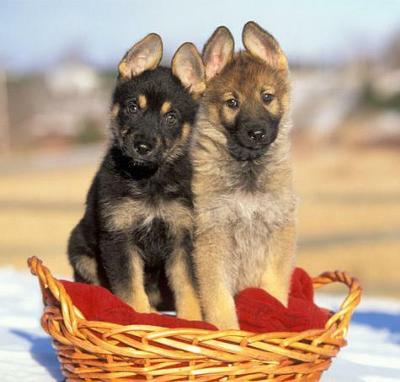 And when I'm old enough I plan to get my own German Shepherds, and love them just as much as I loved my dogs. I was 4 when I left South Africa but I remember my dogs clearly, and hope they had a good happy life. With me in mind. But one thing haunts me, I hope someone can answer. Do you think my dogs knew what was happening ? Would they forgive me ? I didn't want to leave them. But then again I was four. And had no power :-( if I did, I would have stayed with them forever. I just want someone to help me, that it's okay. Because every time i think of them, and having to leave them behind, I get all choked up. But this photo best describes them.